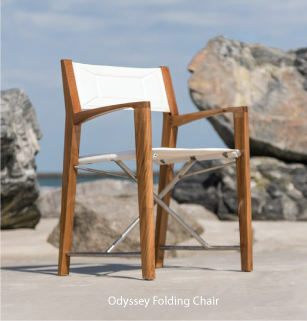 Folding Director Chairs constructed of Solid Teak and and Solid Teak with 316L Stainless Steel. Finished with Sunbrella padded fabric. Both models fold for easy storage. Perfect for Marine use. I received my shipment of teak director's chairs exactly on the date that you estimated. They are exceptionally well-made and appear very sturdy. The proportions are perfect for my use and preference. The teak directors chairs arrived in perfect condition. It is very fine quality teak furniture and I will keep you in mind for further purchases. Thank you for shipping my order by Consolidated Freight instead of UPS. The packing on a wood pallet worked perfectly and was very effective in preventing any damage to the teak directors chairs. It has been a pleasure doing business with you. I am extremely pleased with the two director teak chairs and teak tables that I ordered. They arrived very fast and in good condition. The order arrived just fine and we love the chair. This is the second time we have ordered - in 2003 we ordered 2 Director's Chairs and two benches. Your furniture is of wonderful quality and we wouldn't think of buying teak anywhere else. Dear Folks at WT, The replacement Director Chair covers are fabulous....I like the top stitching design across the 'backs'....the original hunter green seat/back didn't have this design. The order was received promptly and intact! WT replaced our patio umbrella.....no hassle, just as promised when we purchased our set back in 2000....we have had numerous comments from guests about the quality of the furniture and are very happy that we can tell our guests about WT's EXCEPTIONAL guarantee and service. Hoping your business continues to grow as you deserve it. WT's staff couldn't be more pleasant or helpful!